You will discover how pre-planning for yourself of a loved one will ease a difficult time for you and your family and learn about the benefits and peace of mind pre-planning will provide. There is no cost or obligation to attend. 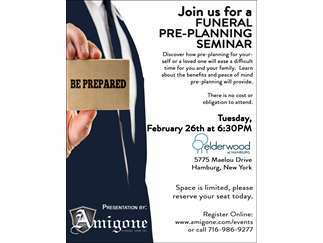 Presentation by Anthony Amigone, Jr. of Amigone Funeral Home, Inc. Space is limited, so reserve your seat today. Register online at www.amigone.com/events or call Kristen Amigone-Sfeir at 716-986-9277.